…and staying alive. That’s what today’s daily bit is all about. You know, the end of the world? Zombiecalypse? The Walking Dead has been over now (albeit temporarily) for a while, and I guess I am suffering withdrawal symptoms. 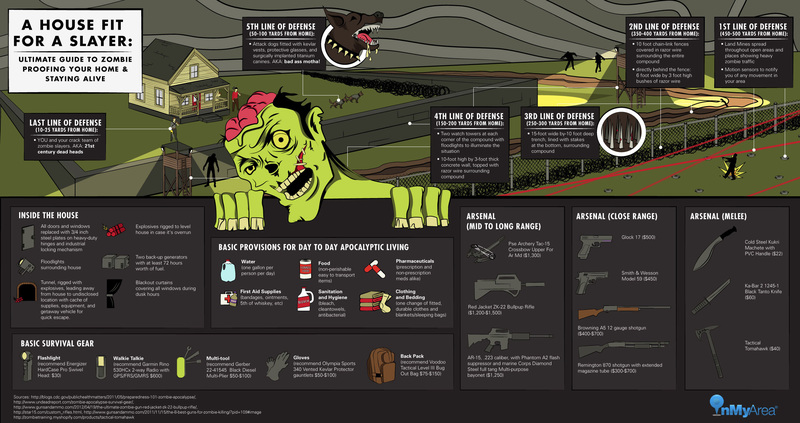 Thank goodness we got a heads up about this infographic about zombie-proofing your home. And it doesn’t stop there: it will help you stay alive. I think the infographic was made for a home security company, so it might very well be a publicity stunt, but that does not take away from its interest value. C’mon, it tells you about zombie-proofing your home! Who wouldn’t want to have all the details in one handy image? Here’s where you start zombie-proofing your home. You need six lines of defense. I think that is pretty detailed, but there’s a huge problem I see here: it requires a lot of space around the house. I don’t know if it’s just me, but if you do not have all that yardage to create the first several lines of defense? I suppose you can focus on the house itself. 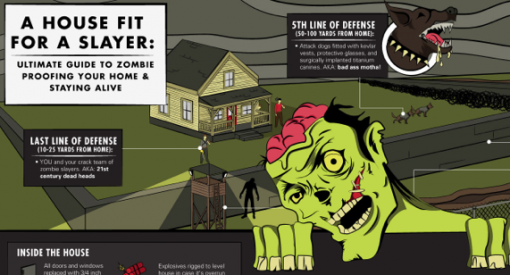 The infographic also gives details on zombie-proofing the house from the inside. Take your pick: steel plates for doors and windows, explosives, backup generators, floodlights, blackout curtains, and escape tunnels. So here’s the ultimate guide to zombie-proofing your home.